A new challenge is being shared today on the Impression Obsession Blog, and I hope you join the fun! The challenge is Holiday Greetings (any holiday)! Pull out your Impression Obsession stamps and/or dies, and join us! The card I created uses the gorgeous Squirrel Circle set, Merry & Bright sentiment, and Holly Leaf Cluster. I created a three panel card, and cut the Squirrel Circle set from the left and right side panels. I adhered some snowflake patterned paper to the center panel, adhered the right side panel to the center, allowing the snowflake paper to show through the die cut image. Finally, I added some colored details with markers, and glitter glue for sparkle and shine. I cut the sentiment, holly, and berries from colored card stock, and adhered them in place on the front of the card. Find all the details on how to enter this week's challenge on the Impression Obsession Blog. Thank you to everyone that visited my blog and left comments on my Impression Obsession winter hugs release posts last week! One name from all comments was randomly selected to receive a $10 USD gift certificate to the Impression Obsession store. Congratulations to Denise B., winner of the $10 gift certificate I am giving away! Denise, I have been in touch with you via email, so check your inbox for details. Yay!!! Picket Fence Studios has a cute release for December, and I am happy to share a card with you that features Have a Cheerful Day stamp and coordinating die. The image is stamped with Black Hybrid ink and colored with alcohol markers. I added glitter glue for sparkle and shine. Check out their full release today at the Picket Fence Studios site. 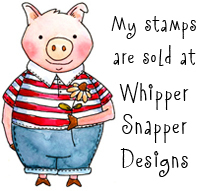 I’m hosting this week’s Mix-Ability challenge on SplitCoastStampers. The theme of this week’s challenge is A Jolly Snowman. Please join us this week for a little mix-ability fun! I made a tag that features the Snowman die set from Impression Obsession. On a tag base, I added my assembled snowman who’s cut from card stock and wool felt, colored with distress ink, alcohol markers, and glitter glue added for sparkle. I added a twine string, hemp bow, and a couple of small rusty bells. Today is the final day of the Winter Hugs release celebration for Impression Obsession, and I hope you have enjoyed the inspiration! All of the new images you have seen on IO designer celebration posts December 10-12th are available now on the Impression Obsession website. The card I made for today features Love Pup. The image is stamped with Impression Obsession black hybrid ink and colored with alcohol markers. Find all the details on this release on the Impression Obsession Blog. 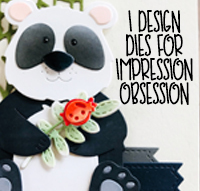 Visit the Impression Obsession site and check out all of the new images. Which one is your favorite? Let me know! I will be giving away one $10 gift certificate, drawn at random from comments left on my celebration posts (there will be three posts - a comment on all three posts means you will have three chances to win the gift certificate!) Comments will remain open on my blog posts until Noon Pacific on Saturday, December 15th. The winner of my $10 gift certificate will be announced on my blog and on the Impression Obsession blog on Monday, December 17th. For a wonderful dose of inspiration, pop on over to the Impression Obsession Blog for a complete list of designers participating in this event. Enjoy the inspiration! Today is the second day of a three day Winter Hugs release celebration for Impression Obsession, and I hope you enjoy the inspiration! All of the new images you will see on IO designer celebration posts December 10-12th are available now on the Impression Obsession website. The card I made for today features Love Language. The image is stamped with Impression Obsession black hybrid ink and colored with alcohol markers. I layered the stamped image over a paper doily, added a couple of cute red gingham fishtail banners, a pale blue swag, and a twine bow. A bit of glitter glue on the heart provides sparkle and shine. Find all the details on this release on the Impression Obsession Blog. Today is the first day of a three day Winter Hugs Release celebration for Impression Obsession, and I hope you enjoy the inspiration! All of the new images you will see on IO designer celebration posts December 10-12th are available now on the Impression Obsession website. The card I made for today is a clean and simple one that features Veronica Valentine, Sweetie Snail, and Heart Balloon. The images are stamped with Impression Obsession black hybrid ink and colored with alcohol markers. 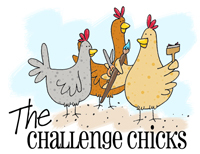 I’m participating in this week’s Free for All challenge on SplitCoastStampers. The challenge is Go for the Gold, and we are to feature something gold and sparkly anywhere on our project. I chose to add a die cut scalloped circle cut from super sparkly gold glitter paper. The momma and her baby are from the I Love You, Momma stamp set from Picket Fence Studios. Coordinating dies for the set are also available, which cut the images out perfectly! The images are stamped in Intense Black Hybrid Ink and colored with alcohol markers. Momma and her baby are adhered to the card with foam adhesive, so they have a bit of dimension from the card base. A new challenge is being shared today on the Impression Obsession Blog, and I hope you join the fun! The challenge is Quick Christmas Cards! Pull out your Impression Obsession stamps and/or dies, and join us! The card I created uses the magnificent Merry Word Block die and one of my very favorite die sets, Jingle Bell Set. I die cut the word panel and bells from white card stock, lightly inked the shapes with brown ink, and added a bit of Stickles glitter glue to the stars and the center of the bells for sparkle and shine. I adhered the die cut panel to a layer of kraft card stock. I stamped Cover-a-Card Knit over the card base in Seaglass ink for added texture. I stuck the panel to the card base with foam adhesive, wrapped the card with twine and added those perfect little bells to the bow for embellishment. I love those bells!